Juul e-Cig review. UK version. One strength UK: 20 mg. US: 59 mg/ml! The Juul e cigarette and Juul Pod kit is now available in the UK but is a much dumbed down version of the USA Juul e cig which has an extreme nicotine content (300% more than allowed by UK regulation). The high nicotine levels has driven high sales in the USA particularly to the younger generation along with inevitable problems of addiction. I don’t know if the extreme nicotine feature was a deliberate marketing ploy by Juul but regulations mean that the UK version has a much lower nicotine level. For smokers used to a normal cigarette and wanting to transition to vaping, the rather square thin feel of the Juul will not be familiar. For me, it is fairly unremarkable without its high nicotine selling point, a nice-looking pod vape kit of which there are now many. But with such a low battery life between charges and tiny (0.7ml) refill pod, will only suit very light or casual smokers looking to transition to vaping. Alternatively you would need to buy 2 or 3 Juul devices to ensure an all day vape. Like most vape devices the Juul has been designed as a way to transition away from cigarettes to vaping as an alternative to smoking. But despite being aimed at ‘the world’s one billion adult smokers’ and stating ‘if you don’t smoke or vape, don’t start’ on their website, they have a large following of teenagers bragging on social media about vaping during class. The wide range of flavours has also been pointed to as a reason for teens choosing Juul with temptations such as crème brûlée and peppermint which hide the tobacco flavour and appeal to kids. In the US, this problem has been compounded by the Juul having a much higher concentration of nicotine (60mg/ml!) than the average e-liquid. In the UK the nicotine concentration in Juul pods is limited to 20 mg/ml because of the UK’s Tobacco Product Directive (TPD) laws. Juul UK offers a slightly different product to the US in terms of nicotine content, however, the design of the device and the way it works remains largely the same. UK TPD regulation has removed the attraction of the higher nicotine concentration available in the USA Juul product. Juul, pronounced ‘jewel’ is a closed-system vaping device which uses Juul pod cartridges. As the system is closed, the cartridges cannot be changed or altered at all so you are limited to one e liquid brand. Each cartridge is filled with a salt-based nicotine e-liquid which may be flavoured. There are nine e juice flavours available including two tobacco and one menthol flavour in the USA but only four flavours available currently in the UK, with only one tobacco e juice. Size: including pod: 94.49 mm X 15.24 mm X 6.86 mm. The e cigarette design is slim and uses an aerosol system to minimise combustion in the device. The look and feel of the device is not similar to that of a cigarette, making it feel unfamiliar to smokers looking to quit smoking using a vape device. But the device is reasonably light and comfortable to hold and can be carried easily. However, do note that a cigarette is still considerably lighter so this device is not light enough to be held between your lips. 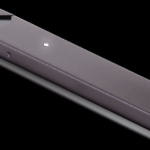 The Juul e cigarette design incorporates a single LED light which comes on when you insert a Juul pod. You can press the area below this light to check the battery of the device. A green light will appear when the battery is full, yellow indicates that you will need to charge soon as there is only half of the battery power left and red indicates that charging is required as soon as possible. The battery life on the Juul is reasonable for the size of the device but is extremely small because of the Juul’s size. It will not last a full day for your average smoker, you would need to buy 2 or 3 Juul devices to ensure you can vape through the whole day. To recharge the device, you need to plug it into a USB port and wait for the green light to reappear. You can use a USB port on your computer or laptop for ease. Obviously you cant vape while it is charging so you either need a second device or have strong nerves. Charging the battery will take up to 2 hours. The pods containing the nicotine salts e liquid only have a 0.7 ml capacity so the majority of ex-smokers will need more than one pod a day: at £9.99 for 4 pods this will become expensive. How an e-cig looks, and functions is only half of the issue, you should also know what it feels like to vape. With this particular design, you may be underwhelmed by the options if you are used to devices where you can tailor your vape, but given the slimline, cigarette-like design, this won’t feature in your thoughts for too long. To start vaping, all you need to do is insert the cartridge and take a pull. There are no buttons, no waiting around, and no need to find the perfect settings for your perfect vape. The main aim here is to create a device for instant satisfaction with minimal fuss and minimal mess. Once you have vaped enough, simply remove the cartridge again and store separately. Another criticism of this system is that the cartridges may get damaged if they are being taken in and out. Juul Labs advise removing the vape juice pod when not in use to avoid leaking or damage i.e. when you are not puffing on it you must remove the pod and store the 2 parts separately which is annoying. There is also an inbuilt temperature control system which regulates your vape to the ensure that every pull is the same. When a cartridge is empty, the device simply switches off. This avoids the acrid taste of burnt vapour and means that you will never get a dry hit. There are fewer regulations around nicotine content in the US which is why Juul can offer cartridges containing nicotine concentrations of up to 60 mg/m in the US. While the FDA is currently investigating the consequences of this, there is no doubt that this concentration is making the e-cig very popular in the US, especially with teens and young adults. The Verge reports that there are now Juul users suing Juul for addicting them to nicotine siting the extreme nicotine concentration used by Juul. In April 2018 the FDA got involved. “We don’t yet fully understand why these products are so popular among youth. But it’s imperative that we figure it out, and fast.” Scott Gottlieb from the FDA said in a statement at the time. The FDA told Juul Labs that they required more information about the company’s marketing strategy. More recently Fortune.com reports that in October 2018 the FDA conducted an unannounced inspection at Juul HQ seizing thousands of documents relating to Juul’s marketing practices. This in itself has put many vapers off the Juul and there is heavy criticism of Juul for using such extreme nicotine concentrations. Does this level of nicotine increase dependency and addiction? This is counter to what vaping is about. The UK is a part of the European agreement to regulate e-cigs across the continent and, as such, companies must comply with the TPD regulations including the limit on nicotine concentration of 20 mg/ml. The USA Juul version is some 300% stronger! In the US, many reviewers have warned that due to the high nicotine content, if you vape too much in one go you may get a serious buzz from the nicotine leading you to feel nauseous afterwards. This is a big concern; firstly because of the attraction this may have to yougsters and second, for those who reach for their vaping devices automatically as it may lead to an increase in nicotine intake rather than the desired reduction – especially if you are in habit of smoking at certain times in the day. This is not as much of a concern in the UK where the nicotine concentration is limited to 20 mg/ml but it is a problem worth highlighting as many people tend to vape far more than they smoked – especially in areas where vaping is permitted and smoking is not. At the moment there are only four flavour pods on offer: golden tobacco, glacier mint, mango nectar and Royal Crème. All are limited to one nicotine strength of only 1.7% nicotine. These flavours are made using nicotine salts as a base rather than free-base nicotine which is used in other similar products. Juul claim that this is can make their vaping experience different to others and cite their use of proprietary chemistry to deliver a vape that is different. However, in the US, it is evident that the flavours offered are appealing to children and young adults as they appear and taste similar to “candy” with bright colours. This is a considerable concern in the UK as well where despite the TPD, many companies are continuing to brand and package their products in bright colours reminiscent of sweet shops. It has been argued in the US that these flavours are clearly targeting children, despite claims from Juul that it is hoping to discourage the next generation from smoking and vaping altogether. The main argument here is that a 40-year-old smoker who has smoked all their life is only concerned with the tobacco flavour in their e-cig so why mask it with all these sweeter flavours? On the other hand, if you are a smoker who is looking to disconnect with smoking completely, would changing flavours help to disassociate yourself from smoking and be a help in your overall aim to quit altogether? Perhaps. It remains to be seen. For nearly 70 years the design of the filter cigarette has stayed the same. However, e cigarette companies are now fighting to attract vapers and to do this they are redesigning vape devices to look more like fashion accessories. They are attempting to create a fashion item and some consumers are buying into it, looking for the next best product based on looks not functionality. The serious minded person looking to quit smoking should stay well clear and get a proper vape device that looks and feels like a cigarette, this will help the transition to vaping. If you prefer a small yet more powerful device the Innokin Jem is your best choice. The Jem is cheaper to run, small-scale, 4 times the battery life of the Juul and allows you the freedom to use any e liquid. There are many studies that clearly demonstrate that there are psychological factors involved with smoking addiction (cognitive and behavioural including handling, holding and puffing a cigarette – the rituals). A “designer e cigarette” will not help this aspect of addiction. Addiction is not just about the nicotine, if it was then NRT patches would work for all of us. Though the US version of Juul e cigarette has come under sharp criticism for its excessive nicotine content, in the UK, this issue is eradicated by the TPD laws across Europe. This excessive nicotine level has no doubt helped Juul Labs sell this product, and perhaps attract young people in the USA to vape with it. This high nicotine “advantage” is not present in their UK Juul version so it is highly unlikely to attract buyers to the same degree in the UK. Removing the high nicotine content results in a pod vape device with a very short battery life. This means that the average smoker will have to take more pulls of the lower nicotine content UK version and have 2 or 3 Juul battery devices. On the positive side, the limit on nicotine content means there is a reduced likelihood of increasing nicotine addiction for users and also attracting young people to this product.